She doesn't even care that the policy she's trying to stop is a matter of national security. All she cares about is imposing her personal agenda on a country that never elected her. Trump is pandering to the religious right which, for religious reasons, disapproves of transgender people. The Trump administration did not study the matter and there is no evidence to support the ban. The ban makes no more sense than did the banning of openly gay personnel. 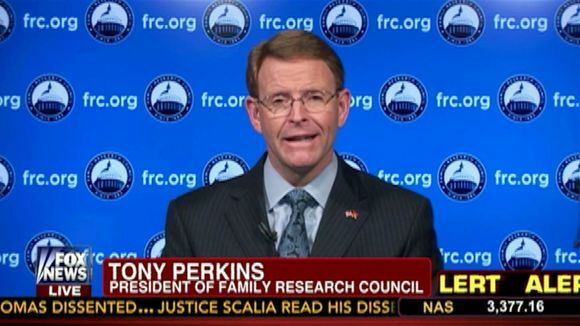 I would note that none of the fear mongering promoted by the religious right (including Perkins) over the demise of Don't-Ask-Don't-Tell has come to pass. This policy was crafted through a comprehensive and inclusive process that included the leadership of the Armed Services, medical and personnel experts across the Department, transgender Service members, outside medical experts, advocacy groups, and the RAND Corporation. In the meantime, people on both sides continue to raise objections about this new wave of nationwide injunctions. "The idea that one judge can impact the readiness of our military is outrageous," FRC's Lt. General Jerry Boykin said. But unfortunately, it happens all the time -- particularly to this administration, who probably spends as much time in court defending Trump's policies as it does writing them. Perkins' intent is to give the impression that people who support things like transgender service are opposed to injunctions like this and this injunction in particular. The cite is actually to an October, 2018 article in The Atlantic in which two law professors argue in theory that national injunctions should be ended. That doesn't put them on any “side” of anything. Perkins lied. Perkins is also a cynic. He knows that his incurious constituency is unlikely to visit the link. And yet, liberals like Beto O'Rourke would love to cede even more. In a campaign speech earlier this week, he suggested adding another five justices to the U.S. Supreme Court. Instead of being ruled by an oligarchy, Democrats apparently want a super-oligarchy. Elizabeth Warren even made the absurd claim that it "isn't just about expansion -- it's about depoliticizing the courts." Since when have liberals, who owe their biggest victories to the courts, wanted to depoliticize anything? The courts are overimportant [sic] as it is. The last thing we need is to give them the keys to the entire legislative branch. O'Rourke did not affirmatively promote the idea of adding judges. He reportedly said that he would entertain the idea. The reason for this is that Mitch McConnell frustrated the confirmation of federal court judges during the Obama administration. This included stealing a seat that rightfully should have gone to Merrick Garland (it went to Gorsuch). Now that Trump is in the White House, confirmations are going through at record speed. Trump has packed the federal courts with a number of ideologues, some of whom are unqualified for lifetime appointments. At the Supreme Court Gorsuch and Kavanaugh are relatively young and likely to serve for decades. But none of this has anything to do with the military service of transgender people.